Chandigarh TGT Master Mistress 2015 Final Selection List: Latest Category weise Provision Merit List of TGT Master Mistress Recruitment 2015 - Latest News of Chd Second Round Document Discrepancies List of Checking Documents:This is latest news that Chandigarh Education Board has released provisional list (category wise) of the candidates who have secured more than or equal to required marks to qualify for document verification for the post of Trained Graduate Teacher (TGT) Master Mistress Posts. The list of reserve category candidates who have scored above 40% marks for SC category and 45% marks for all other candidates had displayed on 30th June 2015. The list of General or Open candidates / OBC Candidates / Ex-Serviceman Candidates can also download their provisional merit list for the post of TGT Master Mistress on the official website www.recruitment-portal.in. Candidates must revise that the FINAL SELECTION of the suitable candidates will be subject to verification of document to check the eligibilty of the candidate based on terms and conditions published in the advertisement for the recruitment of TGT Master Mistress posts in Chandigarh Education Department for Chandigarh Region only. 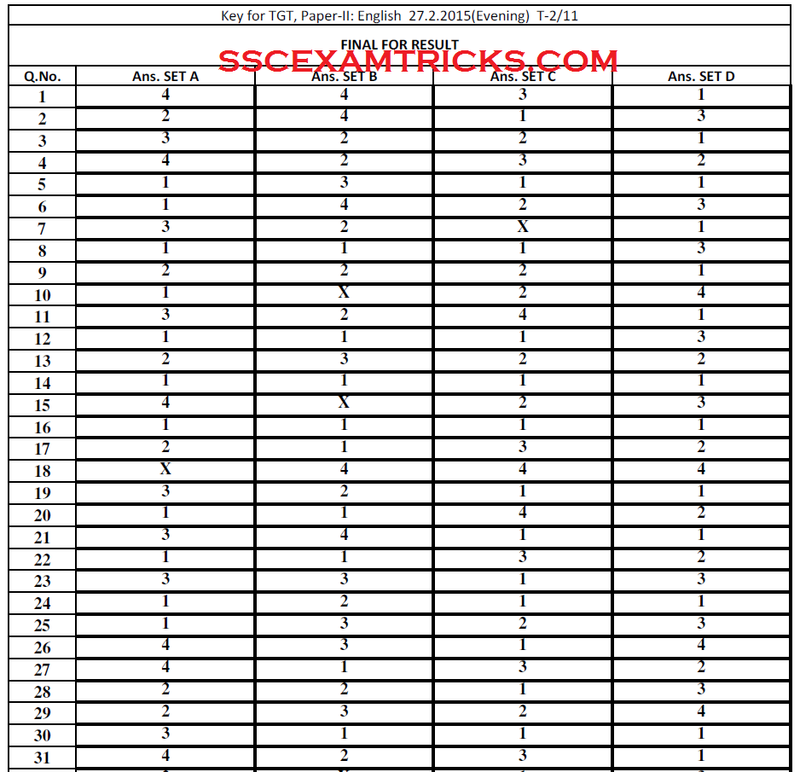 The provisional list has also tells about the minimum and maximum Marks after withdrawal of Questions. The Chandigarh Education Department had conducted checking of original documents of shortlisted candidates on 10th & 11th June 2015 at GSSS School, Sector-10, Chandigarh. On the basis of verification of original documents of attended candidates, Chandigarh Education Department had release discrepancies list of candidates in which remarks from the verification committee are mentioned for the candidates. Those candidates who have certain remark regarding the verification of original documents in the discrepancy list, they are advised to be present on the date, time and venue of further verification of document mentioned in the discrepancy list released by Chandigarh Education Board. Chd TGT Sanskrit Document Verification Result / Discrepancy List: The latest news is that Chandigarh Education Department has released discrepancy list of TGT Sanskrit on 30th of June 2015. The candidates are advised to attend the further verification schedule on 03rd June 2015 at the venue i.e. GSSS School, Sector19, Chandigarh. In case of absent / fail to present their case on the date, time and venue of document verification to the committee, the candidate will be declared ineligible and no further opportunity will be given in this concern. The document verification result of rest of TGT Master Mistress of various subject will be published in few days on the official website. Candidates are suggested to keep visiting regularly to Sscexamtricks.com for getting latest news of every updates regarding the Final Selection of Chandigarh TGT Master Mistress Recruitment 2015 and updates of Document verification. Chandigarh TGT Document Verification (First Round) Result / Discrepancies List: This is latest news that Chd Education Board has declared list of discrepancies of after checking document verification of First round for the post of Trained Graduate Teachers (TGT) on official website www.recruitment-portal.in. Those candidates who attended can download their descrepancy list from direct link given below. Click here to view notice regarding of documents Verification for the post of TGT. 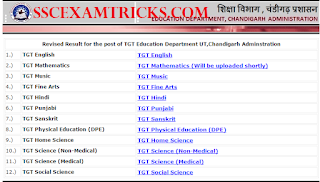 Chandigarh TGT Exam OMR Sheet Available -recruitment-portal.in. Latest News on 06th June 2015: Chd. Edu Board has made available Chd TGT OMR Sheet 2015 from 06th June 2015 to 28th June 2015 for the reference of the candidates. 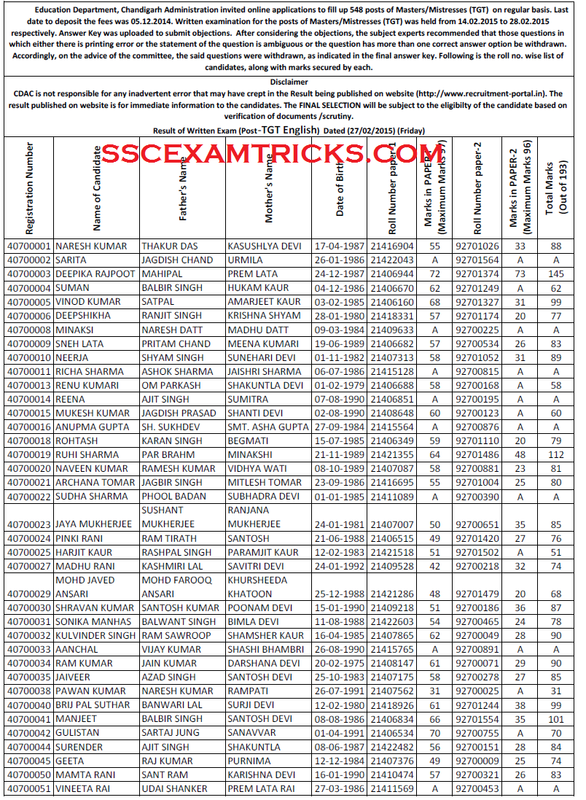 Chd TGT OMR Sheet 2015 can be downloaded by those candidates who had attended written test which was held from 14th February 2015 to 28th February 2015. 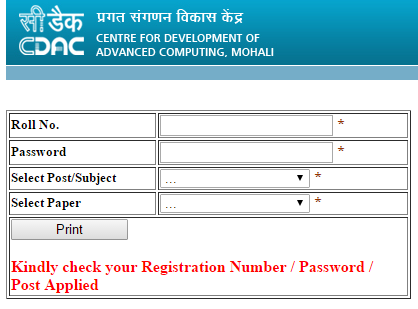 To download Chd TGT OMR Sheet 2015 by giving details of Roll number, Password (as in application form), post/ subject and paper of the candidates on the screen which will appear which candidates click on the link given below. 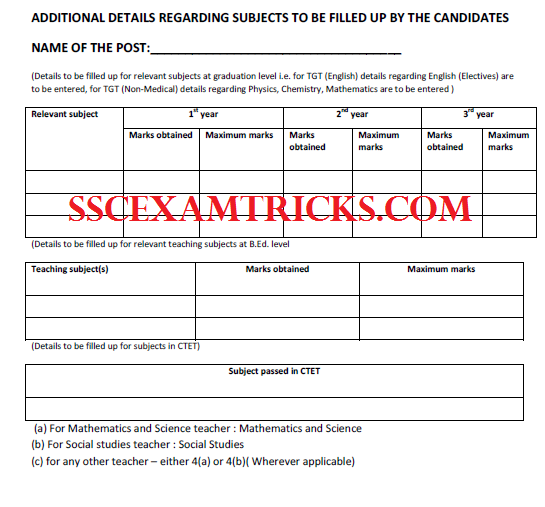 Candidates can download Chd TGT OMR Sheet 2015 from the direct link provided below. Chd. Edu Board has released performa in which ADDITIONAL DETAILS REGARDING SUBJECTS TO BE FILLED UP BY THE CANDIDATES and required to be submitted at the time of document verification which is scheduled from 10th June 2015 onwards for the post of Trained Graduate Teachers (TGT). Candidates can download Admission information form with instructions to candidates attending document verification from the direct link provided below. Chd. Edu Board has released document verification schedule for TGT Teachers (Master / Mistress) on 27th May 2015 on official website www.recruitment-portal.in. The document verification of shortlisted candidates is going to be held from 10th June 2015 to 11th June 2015 at Govt. Model Sr. Sec. School, Sector-10, Chandigarh. Candidate wise document verification schedule will be released very soon. Those candidates who had shortlisted for document verification, can download their category wise merit list from direct link provided below. Chandigarh Education Board had declared Chd TGT Revised Result on 25th May 2015 on official website www.recruitment-portal.in. The Chd TGT Revised Result announced containing registration number, roll number, name, fathers name, mothers name, date of birth, marks in Paper 1, marks in Paper 2 and total marks of the candidates. The final selection will be subjected to the eligibility of the candidate based on verification of document / scrutiny. 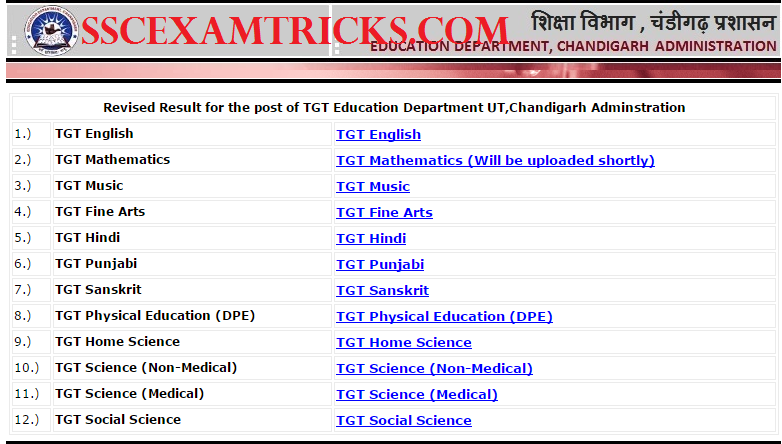 Chandigarh Education Board had declared TGT Result on 23rd April 2015 on official website. 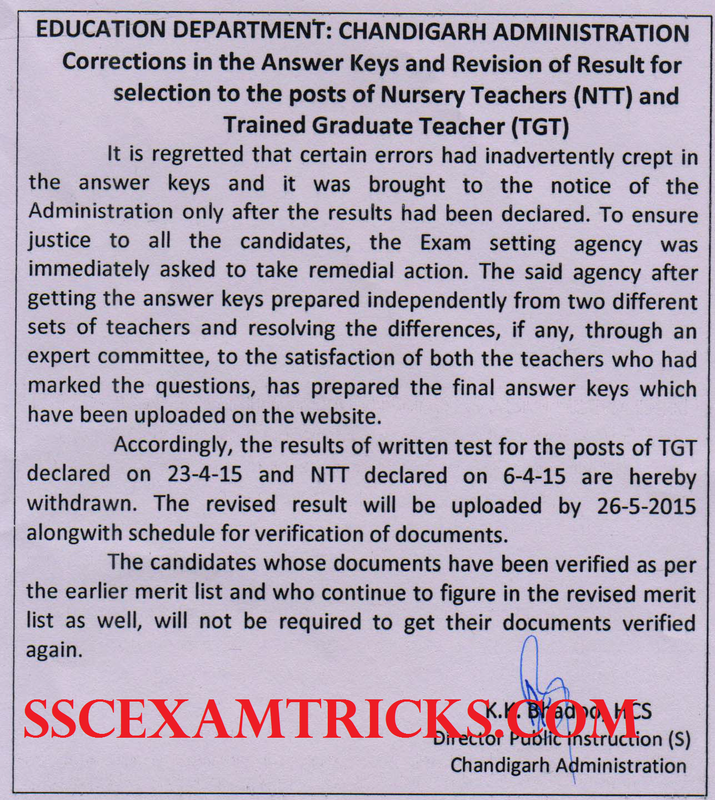 The Final Answer keys had been already uploaded on the official website on same date as result has announced for written examination. The latest news that Chandigarh Education Department has released official notice on 19th May 2015 in which it is said that Chd Edu Deptt going to declare revise result on 26th May 2015 of written examination which was held in Feb/March 2015 for the post of NTT in Chandigarh Region only. This post is published for the purpose to inform you about latest news of Chandigarh TGT Selection by Chd Edu Board in Chandigarh Region only. As answer keys matter has resolved by the Chandigarh administration so those candidates who had appeared in written examination and waiting for revised result, they can download their TGT revised result from the direct link provided below. Chandigarh Education Department (CED) had conducted written examination of Master Mistress TGT for Paper 1 and Paper 2 which was scheduled from 14th February 2015 to 28th February 2015 at various centres in all over Chandigarh. A huge number of candidates had appeared from all over the country especially from Haryana, Punjab and Delhi state. The latest news is that Chandigarh Education Department has released online result on 24th April 2015 for Chd TGT Master Mistress Exam. The Final Selection will be done based on performance in written examination (Paper 1 & Paper 2) for 548 posts of TGT / Master/ Mistress. No interview will be conducted for shortlisted candidates. Those candidates who had appeared in the written exam can download result scorecard marks detail from the direct link provided below. 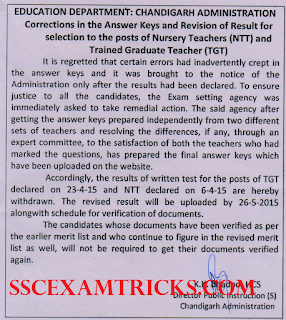 · Click on the link say Result of TGT Exam 2015 Paper 1 & Paper 2. 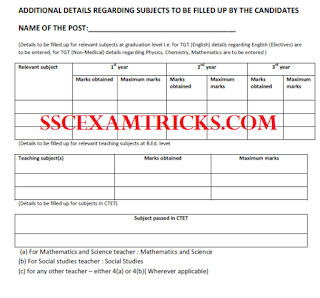 · Download result of All Sets in PDF. Chandigarh TGT Exam 2015 was successfully conducted on the various dates from 14th February 2015 to 28th February 2015. The Chandigarh TGT Exam was conducted by Pen MODE. The OMR sheet was to be filled by Blue/Black ball point pen. In the exam two objective type papers i.e. Paper 1 & Paper 2 of 100 Marks each were conducted in both JBT & NTT Exam. Candidates will be selected on the Merit based on total marks obtained in Paper 1 & Paper 2. Exam Paper 1 exam was conducted in morning from 10 AM to 12 PM and Paper 2 was conducted in afternoon from 3 PM to 5 PM. Paper 1 was consisted of various sections English, Hindi, Mental Ability, Teaching Aptitude and General Awareness of 20 questions of 20 marks for each section. The Exam was a multiple choice question paper of 100 questions of 100 marks. Four options were provided out of which candidates need to choose one correct answer. Paper 2 was consisted of various 25 questions of each subject related to Math, Science, Social Studies and Punjabi. The Exam was a multiple choice question paper of 100 questions of 100 marks. Four options were provided out of which candidates need to choose one correct answer. Candidates can download Answer Keys of PAPER-1 of all subjects and PAPER-2 of TGT (Social Studies, Medical, Non-Medical and Mathematics) on 24th April 2015 on the official website recruitment-portal.in. Candidates can download Answer keys of PAPER-2 of TGT (Hindi, Punjabi, Sanskrit, English, Fine Arts, Music, Home Science, Physical Education) from the direct link provided below. Candidates can download Answer Keys of PAPER-1 of all subjects and PAPER-2 of TGT (Social Studies, Medical, Non-Medical and Mathematics) on 3rd March 2015 at 2:00 pm and the objections can be submitted by 9-3-2015 up to 5:00 pm. Candidates can download Answer keys of PAPER-2 of TGT (Hindi, Punjabi, Sanskrit, English, Fine Arts, Music, Home Science, Physical Education) on 11th March 2015 at 2:00 pm and the objections can be submitted by 16th March 2015 up to 5:00 pm. Qualifying marks for Paper 1 & Paper 2 will be 40% for SC category candidates and 45% for all other candidates. NOTE-No interview will be conducted for shortlisted candidates. Final Selection is based on the single stage written examination followed by the verification of the documents. The selection is made on the basis of the performance in written exam of Chandigarh Education Department. No further interview is needed to be conducted for selection of suitable candidate. 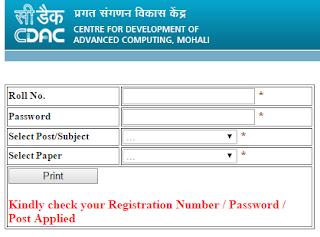 Selected candidates are required to bring computer generated online application, result print, original documents (10th, DMC, Cast certificate –If applicable etc.) and one set of self-attested of all the documents to the venue of document verification. 10th Certificate is used for Age Proof. Candidate must bring at least one Address proof i.e. PAN Card, Ration Card, Aadhar Card, Voter card or Driving License. Candidates are advised to bring two extra colored recent passport size photograph (same as pasted on computer generated application form) required for application form or other document requirements. Candidate must bring Caste/PWD/EXS certificate to claim for seat available for reserve category. If the candidate is an employer of any organization then it is mandatory to bring original as well as photocopy of NOC (No Objection Certificate) with them.